Stephen Allen Covert was born on the 13th October 1964, in West Palm Beach, Florida, USA of part-Jewish ancestry. 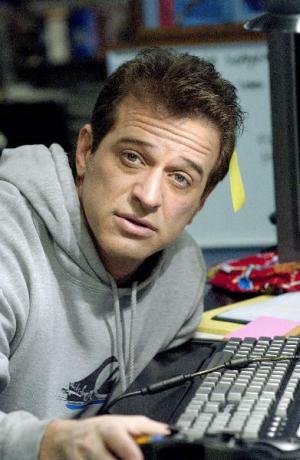 He is a comedian, actor, writer and producer, all of which have added sums to the outright size of Allen Covert’s net worth. It should be noted that Covert is well known for his frequent collaborations with his friend, actor, comedian as well as film director Adam Sandler. He has been active in the entertainment industry since 1989. How rich is the actor? Under the estimations of authoritative sources, the net worth of Allen Covert is as much as $14 million, as of the data presented in the middle of 2016. To begin with, Covert was raised in West Palm Beach, but then at New York University, in which he was a classmate of Adam Sandler. Since then the two have been friends. Talking about his professional career, Covert debuted in the role of a waiter in Sandler’s first film “Going Overboard” (1989). Later, he created small roles in several of Sandler’s films, before his breakthrough in “The Wedding Singer” (1998) alongside Sandler and Drew Barrymore. Moreover, Covert landed significant roles in Sandler’s films including “Little Nicky” (2000), even though the film received negative reviews from critics and failed to succeed financially. Afterwards, he settled again into small appearances and single scenes in the films directed by Sandler, including the romantic comedy film “50 First Dates” in 2004. However, in 2006 Covert starred in the comedy “Grandma’s Boy” directed by Nicholaus Goossen, his only role as the lead actor. Sandler not only starred in the previously mentioned film, but was also the executive producer. Regardless, Covert’s net worth was growing steadily. It should be said that Covert has also had small roles in two films that neither starred nor were produced by Sandler, those two were “Never Been Kissed” (1999) by Raja Gosnell and “Later Last Night” (1999) by Steven Brill. His presence in movies has been reduced in recent years, yet he has continued to play in the film company of Adam Sandler ‘s Happy Madison, in which he is an executive producer and sometimes co-writer. As a writer he worked with the films “Grandma’s Boy” (2006), “The Benchwarmers” (2006) and “Bucky Larson: Born to Be a Star” (2011). To add more, as a soundtrack writer he was involved in “Big Daddy” (1999), “Eight Crazy Nights” (2002), “50 First Dates” (2004) and “Grown Ups” (2010). He has also contributed greatly to many of Sandler comedy albums. Allen Covent has increased his wealth working as an executive producer on the comedy films “Anger Management” (2003), “The Longest Yard” (2005), “Grown Ups” (2010), “Just Go With It” (2011), “Jack and Jill” (2011), “Grown Ups 2” (2013), “Blended” (2014) and “Hotel Transylvania 2” (2015). Finally, in the personal life of the actor, he is married to Kathryn Covert, and the family has four children. At the moment, they reside in California. Covert is a supporter of the Republican Party. 1 He is of German Jewish (from his paternal grandfather), English, Irish, Danish, and German descent. Allen's maternal grandfather was born in London, England. 2 Worked with Drew Barrymore in three films; The Wedding Singer (1998), Never Been Kissed (1999), and 50 First Dates (2004). 3 Worked at the Improv in Los Angeles as a doorman, along with another Adam Sandler regular, Jonathan Loughran. 4 Met Adam Sandler when they attended New York University together. 5 Has acted with Adam Sandler in 14 films, and worked as a producer on 6 of Adam Sandler's films. 6 Gained 60 pounds for his role as Marty in Mr. Deeds (2002). 7 Has worked with Adam Sandler in 12 of his 15 feature films. 8 Gained 40 pounds for his role in Little Nicky (2000). Grown Ups 2010 writer: "Stan the Man"
50 First Dates 2004 writer: "Forgetful Lucy"
Eight Crazy Nights 2002 producer: "Davey's Song", "Patch Song", "Long Ago", "Technical Foul", "Intervention Song", "Bum Biddy", "Grand Finale/It's Your Moment, Whitey! ", "The Chanukah Song Part 3" / writer: "Long Ago", "Technical Foul", "Intervention Song", "Bum Biddy", "Grand Finale/It's Your Moment, Whitey!" Big Daddy 1999 producer: "The Kangaroo Song" / writer: "The Kangaroo Song"